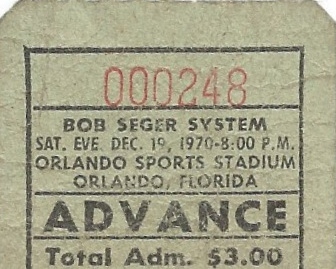 A ticket stub for a concert featuring the Bob Seger System at the Orlando Sports Stadium, which was also known as the Eddie Graham Sports Complex. A member of the Rock and Roll Hall of Fame, Bob Seger is an American rock musician from Michigan who has been performing since the 1960s and is known for his gruff, powerful voice. Some of his hits include "Old Time Rock and Roll," "Night Moves," "Turn the Page," "Like a Rock," and "Against the Wind." The concert took place on Saturday, December 19, 1970, at 8 PM and cost $3. Once host to some of the top names in sports and music, the Orlando Sports Complex was demolished by the Orange County Building Department in 1995 due to code violations. Original ticket: Private Collection of Carl Knickerbocker. Copyright to this resource is held by Carl Knickerbocker and is provided here by RICHES of Central Florida for educational purposes only. Weschler, Tom, and Gary Graff. Travelin' Man On the Road and Behind the Scenes with Bob Seger. Detroit, Mich: Wayne State University Press, 2009. Mixon, Bernie. "Sports Stadium Down For The Count." The Orlando Sentinel, November 15, 1995. http://articles.orlandosentinel.com/1995-11-15/news/9511141684_1_sports-stadium-orlando-sports-hoffman. 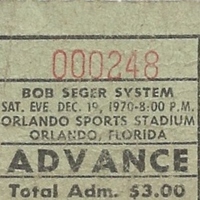 “Bob Seger System Ticket Stub.” RICHES of Central Florida accessed April 25, 2019, https://richesmi.cah.ucf.edu/omeka/items/show/4760.